BSNL due to increase Service Tax from 12.36 per cent to 14 per cent has revised the MRP of Prepaid plans Vouchers available in Punjab Circle. 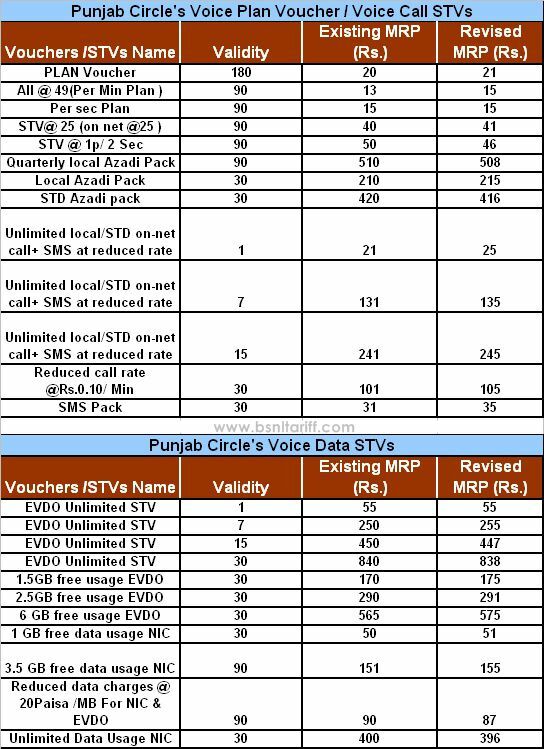 State runs Telecom Circle Bharat Sanchar Nigam Limited (BSNL) has revised the existing Voice call Plan Vouchers and Special Tariff Vouchers (Voice/Data) running Punjab Telecom Circles due to hike in Service tax from 12.36% to 14% with effect from 3rd October, 2015 under Prepaid plans mobile services. The existing Voice call Plan voucher of Rs.20 with validity 180 days and Voice STVs All @49 (Per-minute plan) Rs.13 with validity 90 days, Per-second plan Rs.15 with validity 90 days, Voice call@25 (On-net) Rs.40 with validity 90 days, Voice call @1ps/2sec Rs.50 with validity 90 days, Quarterly Local Azadi pack Rs.510 with validity 90 days, Local Azadi Pack Rs.210 with validity 30 days, STD Azadi Pack Rs.420 with validity 30 days, Unlimited Local/STD (On-net+SMS at reduced rate) Rs.21 with validity 1 day, Unlimited Local/STD call (On-net+SMS at reduced rate) Rs.241 with validity 15 days, Reduced call rate @0.10ps/Min Rs.101 with validity 30 days and SMS pack Rs.31 with validity 30 days has been revised to Rs.21, Rs.15, Rs.15, Rs.41, Rs.46, Rs.508, Rs.215, Rs.416, Rs.25, Rs.135, Rs.245, Rs.105, Rs.35 across Punjab Telecom Circle. As well the existing Data Special Tariff Voucher EVDO Unlimited Rs.55 with validity 1 days, EVDO Unlimited STV Rs.250 with validity 7 days, EVDO Unlimited STV of Rs.450 with validity 15 days, EVDO Unlimited STV Rs.840 with validity 30 days, EVDO 1.5GB free data usage STV Rs.170 with validity 30 days, EVDO 2.5GB free data usage STV Rs.290 with validity 30 days, EVDO 6GB free data usage STV Rs.565 with validity 30 days, NIC 1GB free data usage STV 50 with validity 30 days, NIC 3.5 free data usage STV 151 with validity 90 days, NIC and EVDO reduced data charges @20ps/MB STV Rs.90 with validity 90 days and Unlimited Data usage NIC STV Rs.400 with validity 30 days has been revised to Rs.55, Rs.255, Rs.447, Rs.838, Rs.175, Rs.291, Rs.575, Rs.51, Rs.155, Rs.87 and Rs.396 for Prepaid users. The above revision of MRP will be implemented with effect from 03-10-2015 onwards across Punjab Telecom Circles.